•	Customers looking to save 15% off of their first order with Fresh Cotton should sign up for the free membership club this company offers. All members get an immediate discount on their first order, but also receive exclusive coupon codes regularly as well. •	Check out the “Sale” section of this webstore to find deeply discounted merchandise for sale. Some of these products will be marked down by as much as 50% of more off of their original prices. These discounted prices can be reduced even more when combined with coupon codes. •	Customers can get free shipping coupons from this company, but only as a reward after a certain number of purchases have been made. Fresh Cotton is a Holland-based online store that provides customers with an extensive selection of clothing and apparel from numerous trusted brands such as Nike, The North Face, Calvin Klein, Fila, Vans, to name a few. Customers can visit the website to get a complete selection of their available products, from clothing such as tops, bottoms, and jackets, to shoes, accessories, caps, and many others. Fresh Cotton advocates streetwear and streetfashion which they observe in their product line up. They allow consumers to place orders for delivery anywhere in the world and to place payments online through their website. 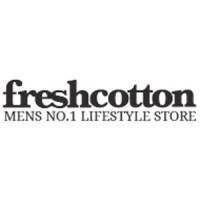 For most up to date offers check out Fresh Cotton on Facebook and Twitter or contact Fresh Cotton Support for any questions.